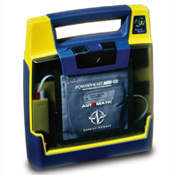 Defibrillator - Tempo Safety Compliance & Supply, Inc. The revolutionary Powerheart AED G3-Automatic simplifies the rescue process by eliminating the need to press a shock button. All that you have to do is attach the device to a person in cardiac arrest. Once the defibrillation pads are attached to the patient, the device detects the person's heart rhythm, analyzes the rhythm using the patented RHYTHMx software, and if a life-threatening rhythm is detected, instructs the user to stand clear and automatically delivers a defibrillation shock. With the Powerheart AED G3-Automatic, Cardiac Science offers the latest advancements in automated external defibrillation technology. The new Powerheart AED G3-Automatic incorporates the Company's patented analysis software and biphasic defibrillation energy waveform.